What started as two avoidable deaths due to heat, has now grown to a city-wide cry for help. 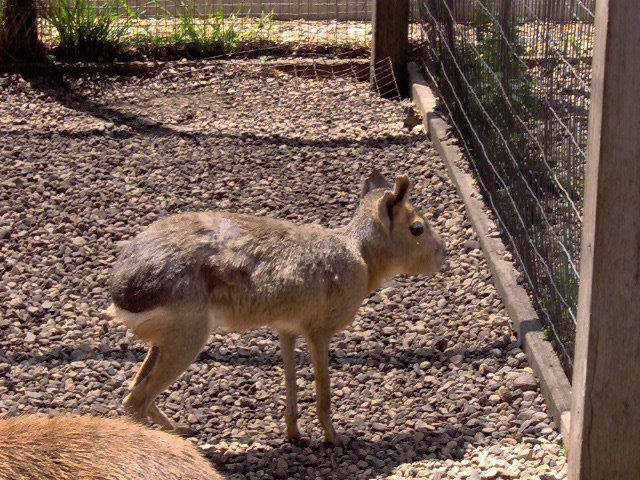 The Oleson Park Zoo is a small town zoo located in Fort Dodge, Iowa. In its beginning it held many of the wild animals that you would find in Iowa, but it has since then branched into the exotic animals. While they are USDA licensed, the big question is, can the zoo owners and volunteers handle these extra animals with the special needs?If you take a walk through the zoo, you will notice that all of the cages look about the same and most of the animals don’t have indoor enclosures to escape into during the extreme Iowa weather. Instead, the animals live under tin roofs that quickly heat up under the summer sun. On July 11, two arctic foxes died at the Oleson Park Zoo, from heat exhaustion after a two-week heat wave in the Midwest. Deaths that could have been avoided, had the zoo known how to properly take care of the exotic animals in their care. While the Zoo’s board claims that the exact cause of death is unknown, a veterinarian said that the extreme heat was likely to blame. With another heat wave coming up this week, citizens of the community are terrified that more animals will meet the same fate as the arctic foxes. Sadly, zoo officials and the USDA say that the animals are just fine. Although, the zoo has temporarily “fixed” the problem, by adding bottles of ice to the cages. Jim Kramer, a member of the Oleson Park Zoo board went on record telling KCCI that the zoo is inspected annually by the USDA and has no history of problems with animal care. With a little searching around on the USDA database, Bailing Out Benji has proven this to be false. Oleson Park Zoo, USDA license number 42-C-0128, has been cited over 15 times in the last 2 years by the USDA inspectors. A far cry from having no history of problems. Interestingly enough, a lot of the citations mirror many of the current complaints of the zoo. 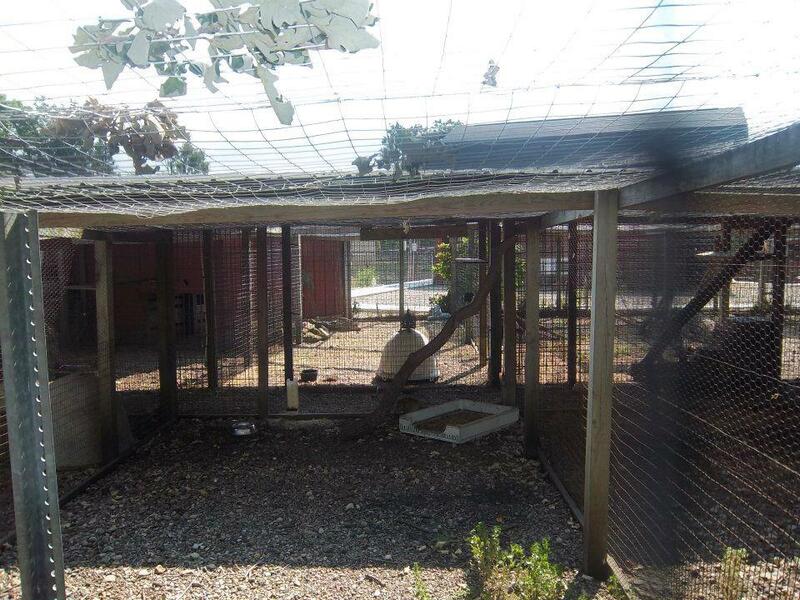 In April of 2011, OPZ was cited for having numerous structural problems in the cages. 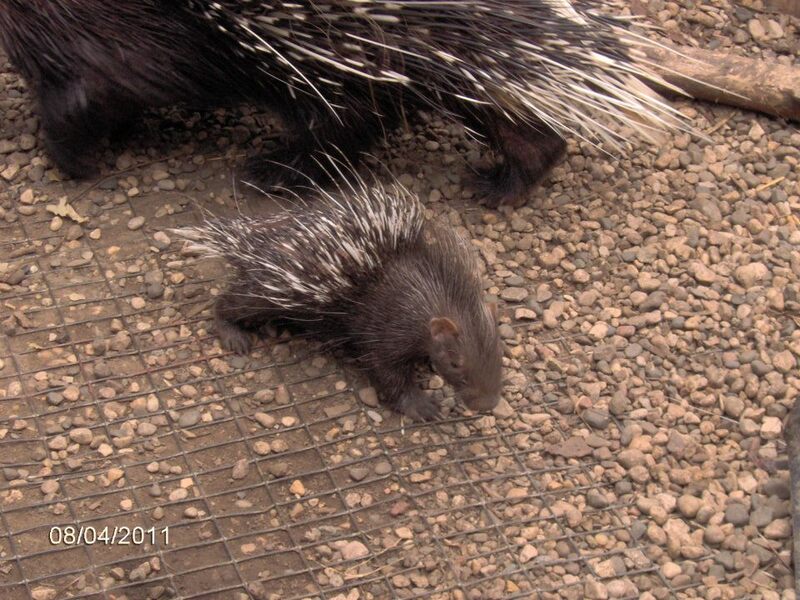 In one instance, broken and rusty wires were protruding into the porcupine’s cage, which is very dangerous to the animal. This photo, coming from the OPZ facebook page, shows a baby porcupine walking on a thin wire bottom flooring. According to the American Wildlife Foundation, porcupines dig small holes to keep themselves cool in the heat. This type of enclosure doesn’t allow for that to happen. This photo comes from the Oleson Park Zoo Concerns facebook page. A page that was set up by citizens of Fort Dodge to bring awareness to the many problems. As you can see here, this is flooring that the zoo laid down for the animals to walk on. 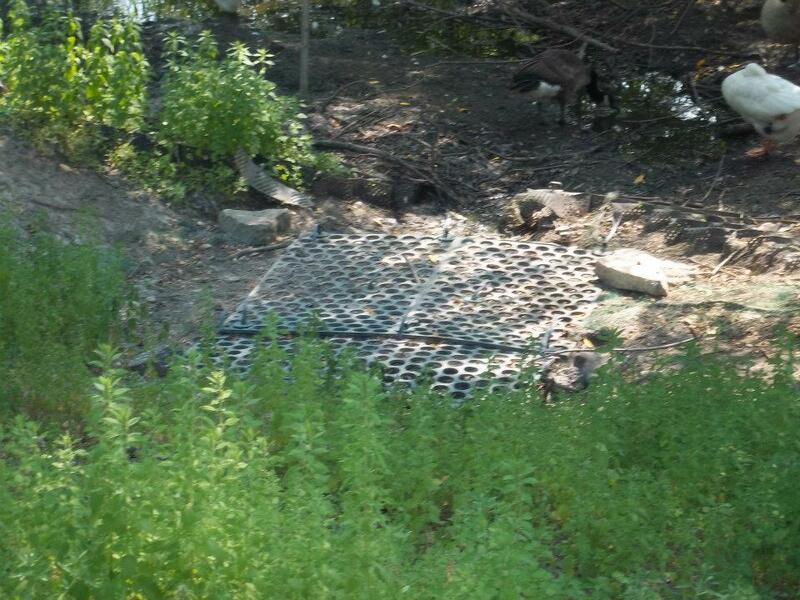 Many say that this isn’t safe, as the geese and ducks can get their feet caught in the holes. The next picture shows more of this “flooring” that the zoo has laid down. Again, it isn’t very safe or comfortable for the animals to be walking on. And if you look to the left of the photo, you will see filthy water that the geese and ducks are expected to swim in and drink from. In nearly every report, the inspectors cites the zoo for cleanliness. Many animals are seen to be living in their own feces, yet the zoo still remains to be open. 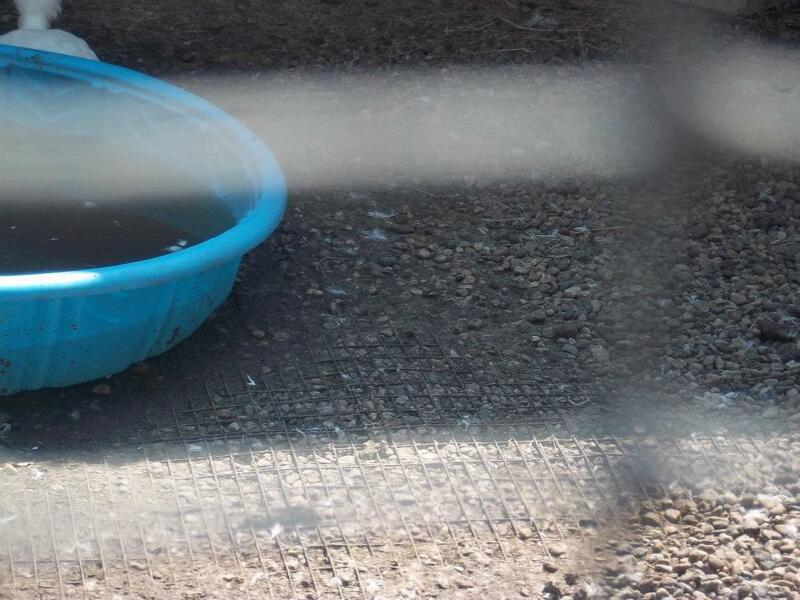 One citation states that “the water bowl in the bobcat cage is severely chewed around the edges and has severe accumulation of algae growing in it.” Inspectors have also dinged them for excessive feces, urine and food waste in the cages and that is a huge concern for the health of the animals. In the food prep area of the zoo, they have been cited for severe fly and pest accumulation, the inspector also noted mice running around. The zoo was also cited for having an accumulation of blood and food waste in the freezer of the food prep room. This photo was also taken straight from the OPZ’s facebook page. It shows a bunch of bag toss games set up right in front of the animal’s cages. 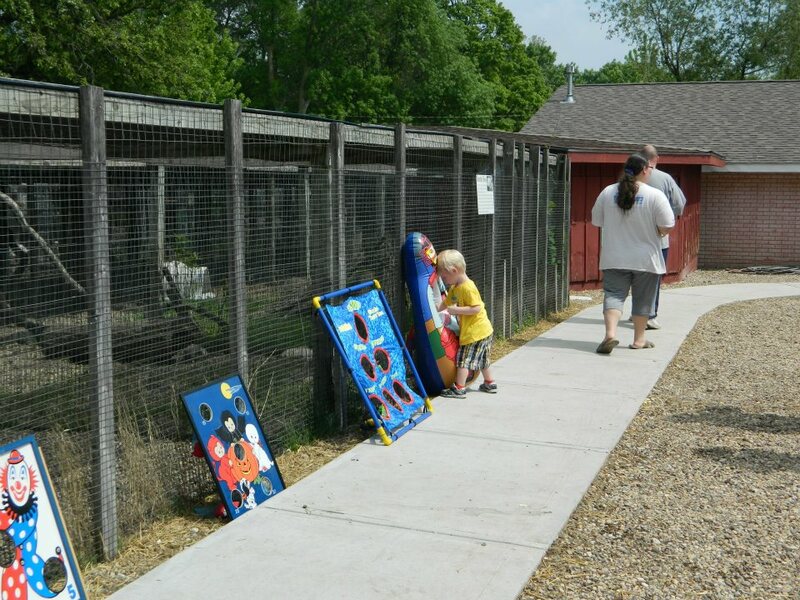 It is my opinion that this is extremely stressful to the animals in the enclosures behind these games. As if the noise of the people visiting isn’t enough, having things thrown at you isn’t conducive to their living situation. That being said, most zoos have to have a perimeter set up around the cages to protect both the animals and the visitors. OPZ, however, has none of these. In 2010, the zoo was cited for not having enough employees to adequately care for the number of animals they had. Since the zoo has not been cited since, the USDA apparently thinks the zoo employees can handle their facility. Yet, OPZ shifts the blame to the lack of employees and donations. A dead, bloated mouse floating in an algae filled tank that the geese and ducks are supposed to swim and drink from. What about you? Do you see any problems with this zoo? Just how many citations can these USDA facilities receive before they are asked to shut their doors? It is gonna be another hot week in Iowa. If you are concerned with the animals you have seen in these photos, please go to the Oleson Park Zoo Concerns facebook page and stay up to date. If you are in the area and plan on visiting the zoo, please be sure to file complaints with the USDA. It is very important that they know how many people are upset with what they see. If you have enjoyed this article, please head on over to our facebook page and like us! Stay informed on the many animal issues that we have going on here in Iowa.